Did you know St.Ives has 7 beaches within a 3 miles radius of it? Pretty nifty, and considering the path between them has some of the most breathtaking coastlines, it's no big deal to have to get to another one. Today I was supposed to do a 2 hour surf session, but there was literally NO waves, so I had the day to wander around the St.Ives area. Another joy of English beach towns is that cream teas and fish and chippy shops are never too far away. There is a "huge" debate whether the best clotted cream comes from Cornwall or Devon. There is also a formidable debate about if cream should be applied on the scone before jam, or the other way around. Here in Cornwall it is jam first, and I did not want to be an upstart. After a decent day of walking it sounds strange to have a cup of tea (especially on a nice warm day as this one), but there is something strangely soothing about it. I also traversed away from the beach in Corbis Bay to the Knill Monument high atop Worvas Hill. This was meant to be a mausoleum for John Knill (who kindly built it for himself), the Mayor of St.Ives in 1767. Ironically enough, he is not buried here at all, rather in London. Hilarious. Still, it has impressive views of the Bay below so it was definitely worth a look see. Figuring that I was at one of the western most points in England, it would be good to take in a sunset. Unfortunately without some cloud a sunset is a bit lacking in colour, however I think it was a fine one indeed. Some people are born to love the water. Others could spend their entire lives without stepping foot in the stuff (luckily for the rest of us personal hygiene wins out enough for a shower). Me? I realized I was the former when I first stepped into the warm waters of the Pacific. From then I was hooked. Something about its organized chaos (we already know the next 300 years of tides), its raw power, its enveloping embrace. It's addicting. So I swapped the warm waters of the Pacific for the (much) colder waters of England. However, the water still leaves me in awe, and England's varying coastline leaves no one wanting. I rolled into St. Ives by train. St. Ives is a town in Western Cornwall, which got its start in fishing and mining. It was because of mining that the famous Cornish Pasty was born. Basically the miner needed some way to eat hearty meals without worrying about getting soot and other nasty stuff on their food. The answer was to nestle meat and veg in a thick savoury pasty crust. This was the miners could easily grasp the food (and not worry about food rolling away of falling off a plate) and keep the innards away from soot. I know I have to get the real thing on my trip! I am staying at The Queens Hotel, and for a mere 60GBP a night a get an ensuite room, wifi (questionable, I am writing this offline as we speak), and breakfast. The best part? Sub 5 minute stroll to the coastline. The waters of St. Ive's do not disappoint. When the sun hits I am rewarded with azure and turquoise colours, undulating in an endless dance. The water is surprisingly clear... a very far cry from the Thames. It reminds me of Poole/Sandbanks in Dorset on the Jurassic coast. Who says England is dreary? Anyways, I checked in and immediately (well after cursing at the wifi) went for a jog. I am now a firm believer in jogging to get to know a town better and see the sights. I jogged around the harbour, watching people soaking up the last rays of sunlight before it dipped over the town. The Harbour is lined with fish and chip shops and pasty shops-- I make mental notes as I jog by. I suppose the downside of coast line is the, hmmm... varying elevation? I hug the coastline and start huffing uphill to the National Coastwatch Institution. These guys got one of the best views in St. Ives but for good reason. They are on the lookout for ships/boats/surfers/kayakers in distress in the coastal waters. The NCI shares this amazing view with St Nicolas Church, which arguably may have one of the best views as far as churches go. Perched overlooking Porthmeor Beach, even I would not mind attending a sermon here. Luckily there was none going on, so on I went. After literally running thru sand in Porthmeor Beach, I caught up again with the South West Coastal Path. This is a National Trust trail which, as the name suggests, hugs the Cornwall Coastline, amassing an impressive 600+ miles. I did not feel up to that daunting task, however went for a few miles on it, stopping every few minutes to snap some photos and simply soak up the coastline. I thought of my Coast to Coast walk, and wondered if I would ever muster the courage to try a walk 300% longer. Food: Blas Burgerworks – Man up try the vegan burger. Made with halloumi cheese, roasted red peppers, and mushrooms, it is a behemoth to behold and eat. Drink: Skinners SkinDog – a great light accompaniment to the burger. Would be great on the beach watching a sunset. Tom and I recently rented a car to drive down to the Southern coast of England this last weekend. When it was my turn to drive we had to stop and get some petrol (that's gas to us Americans). What a shock I received... a Vauxhall diesel automatic cost me 50 quid to fill. And that was only 3/4 tank! So the Vauxhall Meriva takes about 54 liters (about 14.25 gallons) of fuel. 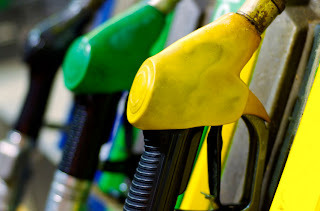 The Automobile Association (think: AAA) said in August diesel petrol prices rose to 139.7p/per liter. So doing the math(s) that would be a fill up would cost 75.44GBP. XE.com has the dollar at 1.557 to the Pound, so the US equivalent is $117.45. How about in the good ol USA? How much would to cost to fill up the Vauxhall Meriva? The issue is that every states levies its own tax rate on gas prices, so its a bit harder to break down. I am using this website, which has average gas prices from as recent at September 2011. I am from New York, so that is what I will use, $3.779/gallon. $3.779 * 14.25 = $53.85.... 34.59GBP. Wow what a difference! About a 45/46% difference. There is also a difference in fuel price breakdown. The US one is here, and the UK one is here. This breakdown of the price of petrol is based on the assumption of a £1 per litre of petrol. So taking into account the 3.785 liter/gallon, if you add the UK taxes up, that equals 2.40GBP/gallon in taxes, which in USD is $3.73/gallon. If we make life easier for me and say gas is $4/gallon, that means we pay $0.52/gallon in taxes. I know I know this varies by states, but the next time you complain when filling up, just think of people in the UK. Now I understand why road trips are kept to a minimum! I am one of those people. I own a Kindle. I know some people think that a Kindle is the death of text, and is the death-knell for libraries everywhere. This article is not about how I disagree with that (I am currently reading, In Defence of the Realm does not come in Kindle format, and I wish it did. It is over 1000 pages and weighs 3.8 pounds!). Engadget posted an article about how public libraries across the US are now offering more books in eReader format thanks to a application called Overdrive. The thing which caught my eye was now it allowed for Kindle Readers. Now, my home library in Buffalo had some books available for the Nook, but not for Kindle. So this was definitely good news for me, now thousands of miles away in England. Now this does not mean you can keep the ebook forever.... no no this is a library remember? So this means you can check out a ebook for a specified period of time (no you can't renew right now, but you can check it out again) and never worry about late fees! Browse and check out a Kindle Book from an OverDrive-powered digital library site. Click the 'Get for Kindle' button. This opens the Amazon.com website. You may be required to sign in with your Amazon.com account if you are not already logged in. Select a Kindle device or Kindle reading app. Click the 'Get library book' button and sync your device or app to download the book, or choose to send it to your device via USB. An active Wi-Fi connection is required for wireless delivery to a Kindle device. If your Kindle is not Wi-Fi capable or you do not have an active Wi-Fi connection, read Amazon's instructions for transferring files via USB. So, what happens if you find a book in EPub format, something not supported by Kindle? Well no worry there is a fix for that, but it does require another software download. I found the solution in this MediaBistro article which talks about a program called Calibre. This program allows you to convert book formats to other ones which are supported by your eReader. You can download it for Windows, Mac, Linux, and even as a portable app! So this is being rolled out across 11,000 libraries across the US, but when I checked the libraries in Buffalo and in Arlington,VA had this now.... so dig out that library card and start supporting them by downloading!